I thought Cube was a fantastic film, and a supreme example of the effectiveness of using an enclosed space as the setting for a psychological thriller. Thus I was pretty excited at the prospect of seeing the director’s next film. Cypher is an interesting film – it fascinated me as I watched it, but now, three hours later, I can’t remember it being that good. There were certainly many things that work against it. First of all, it’s very hard to sympathise with a character whose very identity and motivations are constantly in a state of flux. Jeremy Northam’s character is so disjointed that I found it very hard to actually care about him. Northam seemed to almost devoid of emotion at times, and – assuming this was intended – I think this was a mistake. Whilst the film provided plenty of mystery, I never had much attachment to the protagonist in the way that I did with, say, Dark City. Secondly I think that Natali was kinda spoilt for choice. With a much bigger budget and the ability to move around more than a 5 cubic metre set, the director certainly had big plans concerning the scope of the film. It appears that the makers pushed too far, however – more money is never quite enough money. While the few effects shots in Cube (which I understand were done by the effects company pro bono) were supremely effective, Cypher seems to try just a little bit too hard. Sometimes it looks fantastic, but other times it looks plain silly (ie: the helicopter. Oh, and this big shiny metal thing that seemed to be a leftover from one of the Men In Black movies). I think somebody needed to tell the filmmakers when to stop. All that being said, I did enjoy Cypher quite a lot, I just wasn’t left with any particular wish to see it a second time like I was with Cube. Oh, and can somebody please explain why it’s called Cypher? 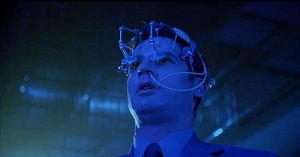 Where Cube, the first feature directed by Vincenzo Natali, was set in the confined space within one small room, Cypher is concerned with the space within one man’s head. Northam plays a corporate spy, seemingly willing to undergo brainwashing and identity change to allow infiltration of a rival firm. He leaves his family and his life behind him, taking on the role of the new character willingly, and seeming to relish the new freedoms and choices it allows.